A few days ago I was looking through my food cabinet for something sweet to eat. I found a berry mix of dried cranberries, blueberries &amp; cherries that I bought last time I went to the grocer. I hadn't eaten much out of it because it was so sweet. I then spotted some plain granola I throw in my cereal some days. It was in that instant that Birdseed was born. 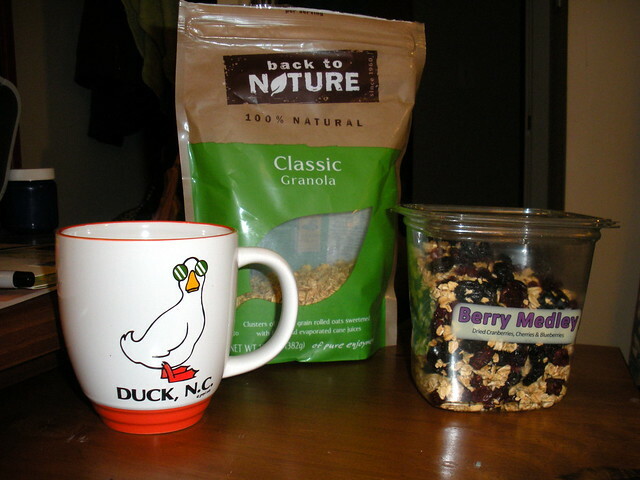 feel free to adjust berry to granola ratio....I added a bit more because the dried berries were so sweet! I mixed it together in a ziplock bag (which is a little bit wasteful so I'd recommend putting it in a container you can close &amp; shake up. I didn't know what to call it but in my early class everyone commented on how it looks like birdseed. So, Birdseed it is!